A couple of weeks ago, I shared with you some basic ways to use a colour wheel to get you started with combining colours. So this week, we're going to take a look at a professional colour wheel, which really is a nifty little tool for helping you to throw together colour combinations without having to worry about all that theory. Essentially, you twist the wheel, look at the instructions and the work is done for you! A pocket colour wheel has the 12 primary, secondary and tertiary colours around the outside of the wheel, and a rotating disc in the middle. 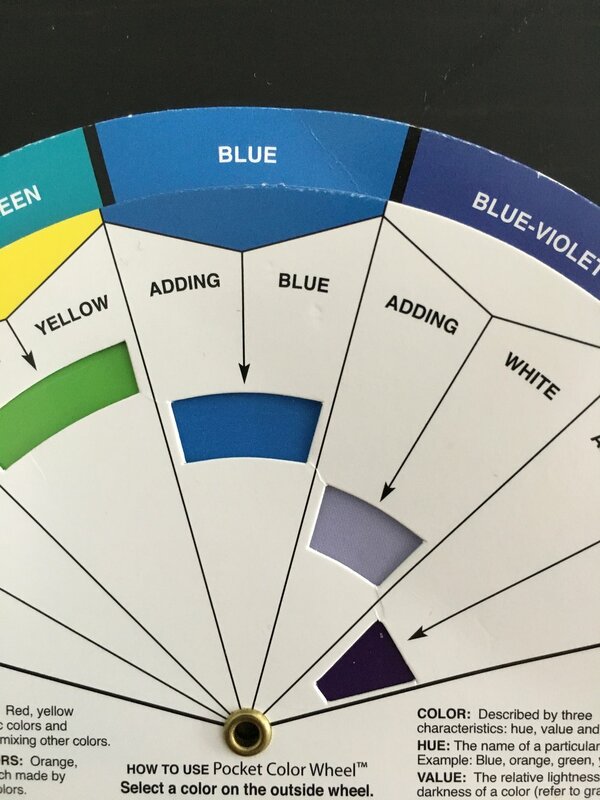 The front of the wheel gives an explanation of key terms used in colour, such as tertiary colours, advancing and receding colours, hue, value and intensity. It also gives a handy reminder of what tints (colour + white), tones (colour + grey) and shades (colour + black) are. 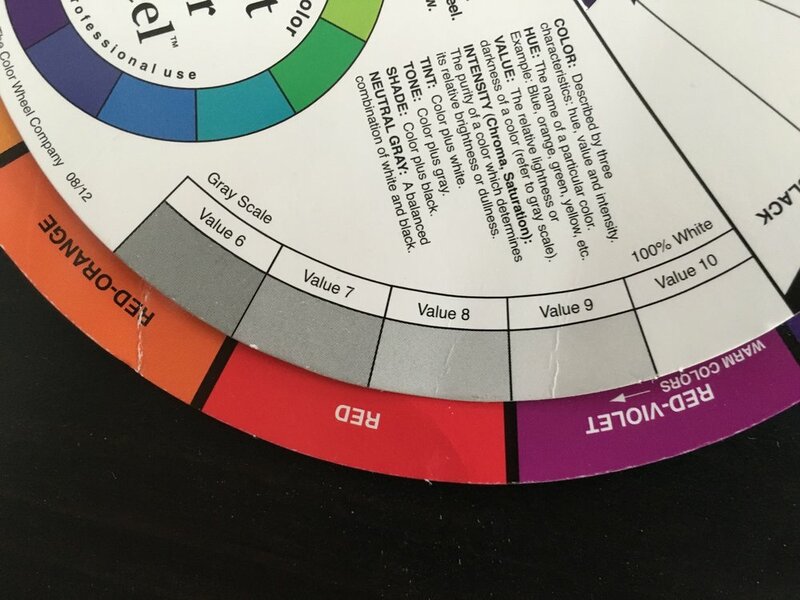 This colour wheel is from The Color Wheel Company, and is available on Amazon. When you rotate the inner wheel to point to one of the colours around the outside, the cut-out windows on the inner wheel show you what happens to the main colour, when you mix it with others. So in the images below, you can see what happens to blue when you add red (image 1), when you add yellow (image 2), and when you add blue (image 3). The wheel also shows you what happens when you add white or black to a colour (known as tints and shades). 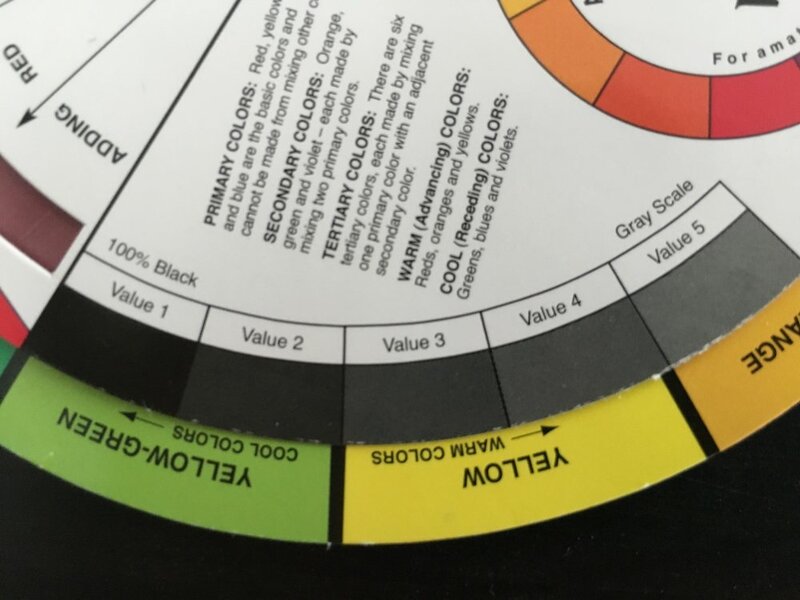 On the edge of the inner disc, there are grey scales, showing how the colour varies from 100% pure black to 100% pure white, through various shades of grey in 10% increments. This helps you when you are out and about to compare different intensities of colour. But it's when you flip the colour wheel over that the fun begins, because this is where you begin to create colour combinations, and learn about colour relationships. The back of a pocket colour wheel. Each of the 12 main colours from the front get split into tints, tones and shades on the back. This is really helpful, because it is very rare that we use colours in their full intensity and saturation. Now, the really clever bit of the wheel happens in the middle. You start by pointing the 'pure colour' arrow to one of the colours you want to use in the room (see in the image above, the pure colour arrow is pointed to blue?). Then, you look at the diagram in the middle of the wheel, and simply follow the arrows for your chosen scheme. If you are looking for the colour's complement, you just follow the arrow across the wheel to the other side. If you are looking for a three-colour scheme, follow the arrows along the edges of the triad or split complementary shapes. And if you want a four-colour scheme, you need to twist the wheel slightly so that one corner of the tetrad box lines up with blue, and then simply follow the edges of the tetrad shapes. Complementary Colour Scheme: Blue with orange. Tetrad Scheme: Blue with Orange, Violet and Yellow.